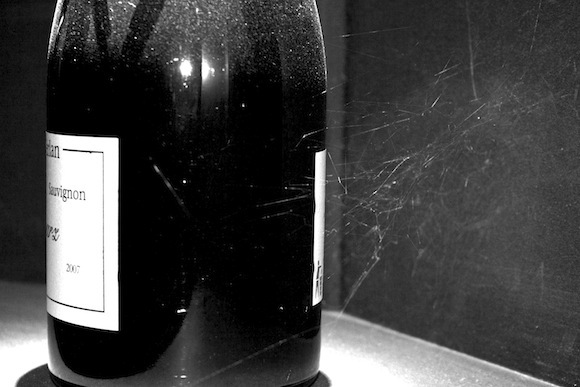 Gewürztraminer can be a pungent, viscous and overbearing beast. At the hands of Cantina Tramin’s winemaker and technical director Willi Stürz though, it is a different animal altogether. Aromatic, yes. But with a purity and comparative lightness that belies its high alcohol level. 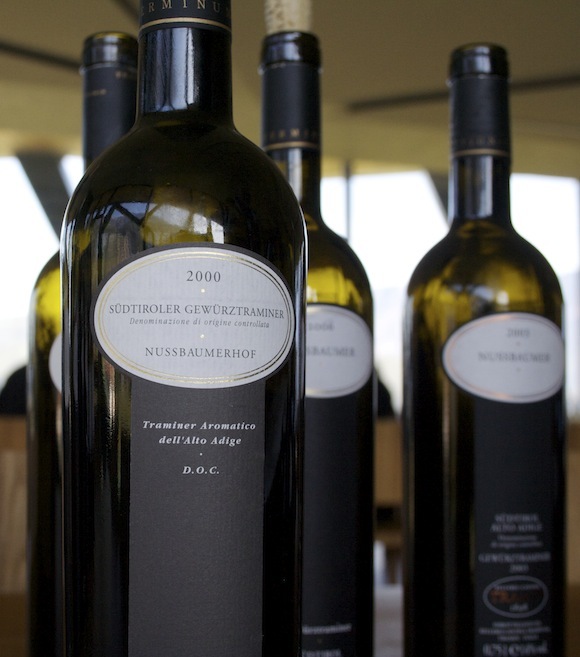 The 2010 Nussbaumer – its flagship Gewürztraminer line – has an intense aroma of rambutan, the less floral relative of the lychee, with clean blossom and tropical fruit flavours. It is utterly delicious. It’s not just down to Willi’s winemaking talents of course – as I’m sure he’d be the first to admit. 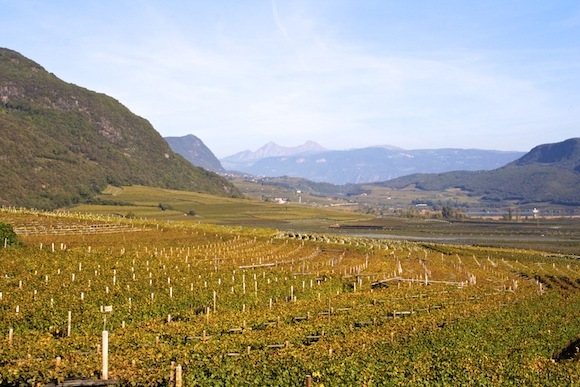 The grapes are grown in the gravel, clay and limestone slopes of the Alpine foothills in Alto Adige, the German-speaking part of Italy. Hot days, cool nights, a strong afternoon wind call the Ora and an early autumn gives these grapes a lengthy ripening time, while retaining high levels of acidity. Which is what gives this Nussbaumer its sense of freshness and balance, despite a stonking 15% alcohol by volume. While many believe it’s the wine makers of Alsace who have truly captured the essence of the grape, this more restrained style at Tramin speaks to my heart. The village of Termeno (or Tramin as it also called locally) is widely regarded as the home of today’s Gewürztraminer. Perhaps unsurprising then that Catina Tramin, the winery, sees the Nussbaumer as its most important wine. It ages marvellously too. On a visit to the winery, as part of the European Wine Bloggers Conference (EWBC), I got the chance to sample the Nussbaumer 2000, which had developed an appealingly stinky vegetal edge to its tropical charms. According to Willi, it had another five to seven years before it was over the hill. A fifth of grapes grown for Tramin is Gewürztraminer. I say ‘grown’ because Tramin, like many other local wineries, is a cooperative. Established in 1898, it is the third oldest in the area. Its 270 members get paid according to the quality of grapes they produce each year, not on the weight of grapes; each vineyard’s yield is set by the winery but it is down to the vineyard owner to grow the very best grapes he or she can. The second largest amount of grapes grown is Schiava, a native red grape. Then there are smaller amounts of a variety of grapes including Lagrein (another native red), Pinot Bianco, Chardonnay, Sauvignon, Riesling, Pinot Grigio, Pinot Nero (Noir) – I got to taste all of these, either as varietal wines or blends, gazing out at the Alps in the far distance as I sipped, swooshed and spat. My lasting impression is of vibrant young wines, focused varietals, elegant blends and some fascinating evolutions. Take the Unterebner Pinot Grigio. The grapes for this wine are grown at very high altitudes in extremely small yields, and because of this elevation, the grapes are left to ripen on the vine for a lot longer than if they were grown in the valley below. Willi and his team press the grapes as whole bunches, rather than de-stem them first, as is the usual practice for white wines. As a result, this fleeting brush with the polyphenols in the skin, pips and stalks of the grapes give this Pinot Grigio some structure for ageing. While the 2010 Unterebner was rounded with a mineral finish (though the alcohol felt a bit prominent) the 2002 smelt of mild brie and peaches, with vegetal flavours weaving their way through the still-bright fruit. The 2008 Maglen Pinot Nero was light and silky, tasting of crushed raspberries supported by a subtle slick of butter. The 2009 Urban Lagrein is dark, intense, and brambly with high acidity and – we were informed – a great match for venison. The late harvest 2009 Terminum Gewürztraminer was just super, if you like dessert wines lively and fragrant. And it wasn’t just me who thought this. My neighbour let out an audible groan of pleasure. The 2006 has a richer, more marmelade feel to it. My personal favourite though was the Stoan, a blend of Chardonnay, Sauvignon, Pinot Bianco and a dash of Gewürztraminer. We started with peachy 2010 with sharp spikes of acidity poking through its gentle creamy cloud through to a softer quince-flavoured 2006 and ended with cougar-like 2004, spicy and racy and still very much on the prowl. It was a great tasting and sealed my love for wines from Alto Adige. 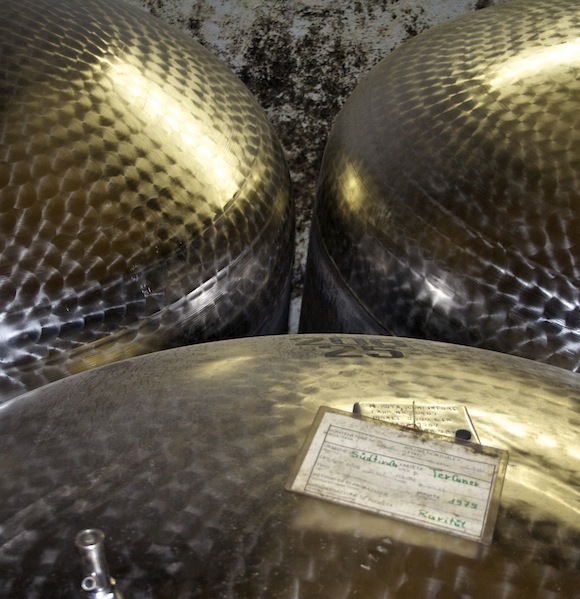 Cantina Tramin is surrounded by other stellar producers such as Hofstätter, Foradori, Lageder and Terlan. We visited the latter in the afternoon. When we got to Terlan, we were sleepy from lunch and well behind schedule. Some of us wondered how Terlan could grab our interest. Then they pulled the rabbit out of the bag. A Pinot Bianco vertical tasting with a wine dating back to 1959. Terlan has a thing about ageing its wines. In the cellar, we were shown a tank that still contained a wine placed there in 1979, sitting quietly on its lees. A harmonious white flower and citrus 1999 Terlaner, a blend of Pinot Bianco, Chardonnay and a touch of Sauvignon Blanc; a 1994 Chardonnay with flavours of camomile tea, dried grass and grapefruit peel; and a smokey, savoury 1991 Sauvignon were my star pupils in this tasting. The evolution of Pinot Bianco through seven bottles ranging from 2010 to 1959 was the most educational and intriguing. Take the tongue-tingling new release 2010 Pinot Bianco, the 2004 Vorberg (named after the vineyard) with its rye bread and fungal characters, the nutty, cooked stone fruit flavours of the 1999 Vorberg Terlano, the apricot compote and candied citrus peel 1987 Pinot Bianco. And finally, the 52-year-old wine which is the oldest I’ve every tasted. There’s no denying this was an acquired taste for modern palates used to fruit forward wines. I can’t see me sitting by the fire sipping this slowly – unless surrounded by other wine geeks where we could happily analyse it over the course of an evening. For me though, wine isn’t just about instant gratification. It’s about trying to understand what makes it tick. And seeing a wine develop over several decades is the ultimate thrill. 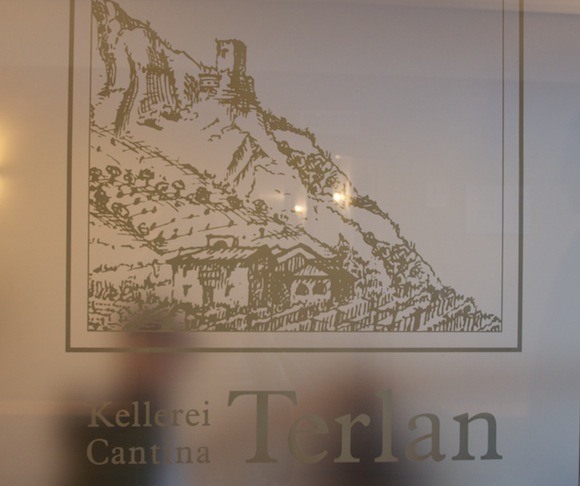 You can read more detailed accounts on the visit to Cantina Terlan, and the wines we tasted, in posts by Katie Myers and Alexandra Corvo . 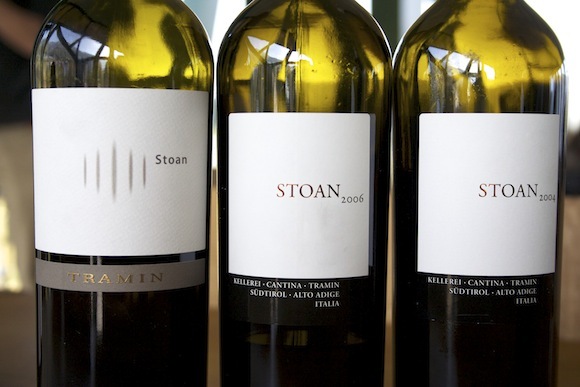 You can find both Cantina Tramin and Terlan wines in a number of wine merchants and restaurants around the UK. A quick search revealed some Tramin wines at online suppliers Great Wines Direct, Strictly Wine and Terlan wines at Experience Wine and Mill Hill Wines. If you find them in other retailers, please do let me know. Great post! I loved both visits also but the flight of Gewurztraminer at Tramin was the winner for me. Got to love a winery that uses a quote from the book Perfume in it’s press kit.